We have known the plan for over a year. The Lakers want to be major players in free agency this July. While they have hedged their bets by backing off some of their stronger comments about their goals — mostly by highlighting “flexibility” and opening up the summer of 2019 as a viable target date for signing players — no one interprets those comments as more than that: a hedge. We know the team is looking at 2018 as a time to make a splash and we know who the targets are: LeBron James and Paul George. Of course, some things have changed since Pincus wrote his piece. For one, Corey Brewer has been waived so there is no need to renounce his rights. And, two, Julius Randle is proving to be too damn good a player to simply renounce and let walk for nothing. Seriously, he’s too good. On Sunday night he brutalized the Cavaliers to the tune of 36 points, 14 rebounds, and 7 assists. It’s the first time a Lakers player has reached those thresholds in nearly a decade, when Kobe Bryant did it in 2008. In March he’s averaging nearly 23 points and 9 rebounds a night. In February he was at a shade over 19 points and 9 rebounds. He’s playing strong defense and dishing out assists too. This isn’t a fad. Keeping Randle, then, should be a priority. Or, at least, I think it should be (something I’ve thought for a while, but I digress). So, how can the Lakers keep Randle and still get their hands on two max free agents? Well, they’ve already started down that path, but some difficult work remains. First, the front office made headway down this path when they traded Jordan Clarkson and Larry Nance to the Cavs at the February trade deadline. Clarkson’s salary for the 2018-19 season is $12.5 million. Nance’s is $2.3 million. By trading both for the expiring contracts of Isaiah Thomas and Channing Frye, the Lakers have opened up needed cap space and made the chase for two max players more realistic. Their work is not done, however, and this is where things can go sideways quickly. After this season, Luol Deng is owed $36.8 million over the final two years of his contract. That number is significant and getting out of the entire amount without taking back any salary will be extremely difficult. After the trade deadline when Magic Johnson and Rob Pelinka were holding court with gathered media and explaining the moves they’d made, they were asked about Deng and whether they had any traction in dealing the forward leading up to the deadline. Magic, unable to hide his true thoughts, simply laughed at the proposition and basically said “we wish we could have made a deal, do you know anyone?”. Lololol. Only, you know, it’s not really funny. Not for a variety of reasons, a chief one being Deng is a good guy who only wants to play but is being put in storage while still practicing and traveling with the team to road games. But that’s another story for another day. Getting back to the math of it all, Deng is set to make $18 million next summer. Finding an avenue to trade him without taking any salary back would give the Lakers that same amount in additional cap space. When combined with the amount saved from trading Clarkson and Nance + renouncing the rights to Thomas and Frye + adding in the (estimated) cap hold for the 1st round acquired from the Cavs, the Lakers would open an addtional $31.1 million in cap space — bringing their total amount of cap room to (roughly) $65.7 million (without adding smaller roster holds, but with Randle’s cap hold on the books). Per the previously linked Pincus article, the Lakers will need (roughly) $66.3 million in cap space to sign a 10-year max free agent (aka LeBron James at 35% of the cap) and a 9-year max free agent (aka Paul George at 30% of the cap). A trade of Deng, then, would leave them only $600K short of having the space they need (but closer to $3 million with the smaller roster holds added in). The Lakers could get to that number pretty easily by waiving one or both of the non-guaranteed deals of Ivica Zubac or Thomas Bryant. There are several more layers to this, of course. And it starts with trying to trade Deng. We have a bit of history here. Last summer the Raptors traded DeMare Carroll to the Nets in a salary dump in order to reduce payroll. The cost of shedding Carroll’s contract was a lottery protected 1st round pick and a 2nd round pick. Carroll, however, had $30 million left on his contract, a smaller amount than what Deng is owed. Another data point in this is the Lakers salary dump trade of Timofey Mozgov to those same Nets. That deal cost the Lakers former #2 pick D’Angelo Russell, while also netting them Brook Lopez (expiring contract) and a 1st round pick #27 overall — which turned into Kyle Kuzma. It should be noted, too, that Mozgov made less annually than Deng, but had more guaranteed money left on his deal than Deng does now. So, what would it cost to trade Deng? Based on what it took to trade Carroll — a player who was still a rotation level player and has started for the Nets this year — I would imagine the Lakers would need to give either two 1st round picks or a combination of a 1st round pick and one of either Kyle Kuzma and Josh Hart. I would imagine, too, if the deal took the form of including one of Kuzma/Hart and it ended up being the latter, the Lakers might also need to include a future 2nd round pick. In all honesty, I could live with giving up future picks. I know the Lakers just went through this with the Nash and Howard deals and there will be some fans who don’t want to go through that again. I get it. I’m not going to argue for or against it. I’m just saying what I would do. As for deals that could include one of Hart or Kuzma, I’d be less on board with either of those and, really, would not want to make one at all. I’d seriously not even want to consider this unless put in the position where the team had a firm commitment from both James and George and even then I’d not want to do it. I think the goal should be to surround all of the Lakers current young players of consequence with two max players — which is the point of this thought exercise to begin with; remember, I want to keep Randle too! That said, I think it’s a thought exercise and a conversation worth having and I can guarantee you the Lakers brass is playing out scenarios just like these as part of building contingencies for this summer. Do the Lakers even want Randle and does Randle even want the Lakers? On a certain level, these questions are more pertinent to the principle of this post, even if the answers are more easy to quantify, requiring less real analysis. If the Lakers don’t want Randle, you’ve just read 1,300 words for nothing. 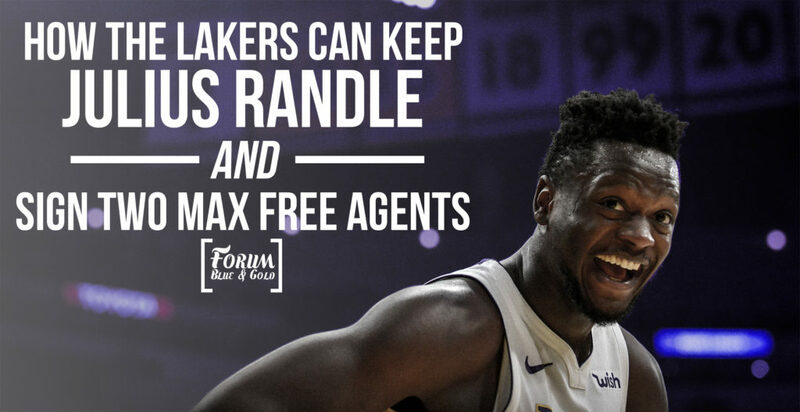 If Randle doesn’t want the Lakers, too bad — he’s a restricted free agent! If the Lakers want Randle to be on their roster next year, he will be. They can match any offer he gets in restricted free agency and that’s that. Full stop. However, there are more variables to deal with than what are outlined above. Randle’s RFA status also means he can put the Lakers in a pinch based on if/when he signs an offer sheet with another team. If I am understanding the RFA rules correctly, a team can sign Randle to an offer-sheet as early as the minute free agency opens at midnight Eastern time on July 1st. However, doing so ties up the offering team’s cap space for the full moratorium period, which ends July 6th. Further, the Lakers would have 48 hours to match that offer sheet, meaning they’d have until July 8th to match. Imagine a scenario where the max FA’s the Lakers want to sign haven’t made up their minds by July 8th. Now imagine Randle signs an offer sheet for an annual salary which exceeds his $12.3 million cap hold. Every dollar above that $12.3 million is one that eats into the Lakers cap space. If it’s in the millions of dollars more (say Randle signs for 4 years/$60 million with the Mavs) before the moratorium expires, the Lakers would need decisions from the max players they’re chasing before July 8th in order to execute the plan to keep Randle and sign 2 max players. If they cannot secure those commitments, they may end up having to make a decision on Randle before knowing what happens with outside FA’s. Continuing down this path, the Lakers could end up deciding they cannot pay Randle the amount another team offered while also not yet having a commitment from the FA’s they want to sign. Then imagine none of those FA’s sign but the team has already lost Randle. Now go to your sunken place. If there’s any recourse here it’s that Randle and George share an agent. 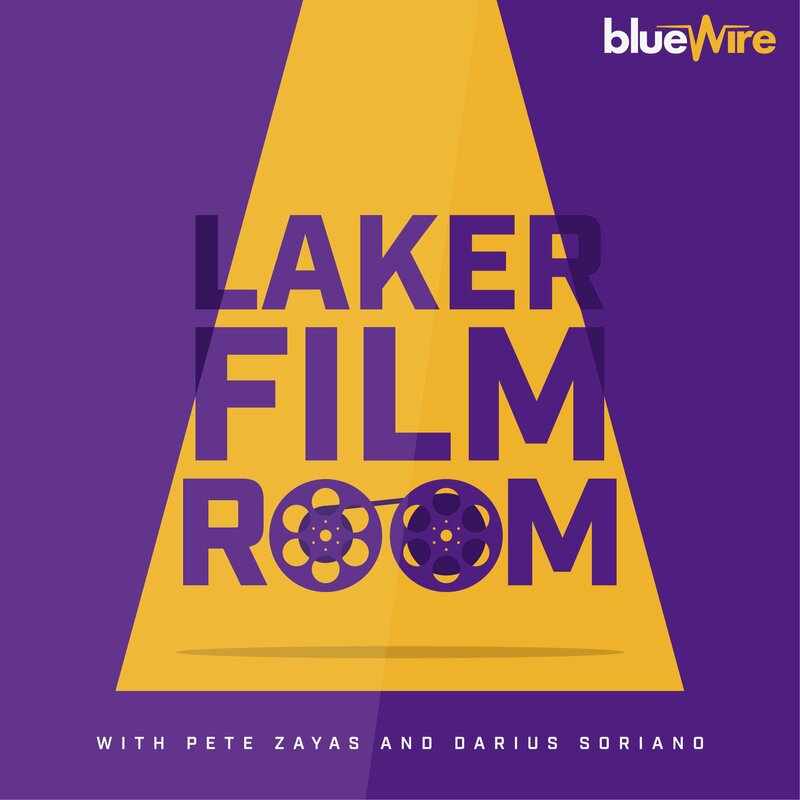 If there’s one person who will have insight into the Lakers’ thinking, Randle’s thinking, and the thinking of one of the Lakers main FA targets, it’s this person (Aaron Mintz). He will know if there’s potential for George to come, whether George wants Randle to be there when he comes, what other teams are offering Randle, and what the Lakers consider a reasonable offer for Randle for salary matching purposes. In other words, if Randle wants to be a Laker and if the Lakers want Randle on the team and if George is in the mix at all, things can easily play out a certain way which favor the Lakers. That’s a lot of ifs. Thinking about all this now is putting the cart before the horse, I know. I’ve consistently said I’m not going to worry about free agency until it’s actually time to worry about free agency. That will likely be sometime after the Finals and around the draft. That’s when I’ll actually get into the tea leaves of what LeBron may do and what George may do. Thinking about them requires restraint unless you want to go crazy. But thinking about Randle is different. His situation is almost entirely controlled by the Lakers and it’s never too early to consider the options and variables involving his next contract. And with him playing so well this year, sorting out the ways in which he can remain on the team next season is slowly moving front and center. The fact that outside FA’s play into that future complicates things, then, and requires an expansion of scenarios to include how it call all work. The good news is that it really can work. The bad news is that it won’t be easy and any number of variables can throw it off in ways that cannot be resolved easily, if at all. Against whatever odds are out there, though, I want Julius Randle to be on the Lakers next year. He’s that good and is worth jumping through the hoops to make it happen.